I am in the middle of a hair dryer machine design, we have some issues about imaging correct symbols in order to establish the maintenance easily with the user. Our point of interest is designing a rigid hair conditioner, which corporates natural and elegant materials those doing their job with imperfection. So we're up to production-level product. Our hair conditioner has two basic variables, these are speed of the fan and power of the heating resistance. We have a contradiction at this point, we could not decide how to image that kind of control. As we made a research about the issue, there are three ways to show, for instance the resistance level, one is min (or off) to max, a fader. Second one uses two static levels, I, II and III. Third one is 40 C, 80 C and 105 C as resistance temperature. Whereas the first two are mentally bijective, third one seems more professional. However, is it really good to use such a scientific scalar? Because, most of the users could not differ temperature and heat. Also, interoperability and localisation is one of the obstacles, not every country use Celsius, nor Fahrenheit. One last point to decide, we use either fader or single switches. Faders are more user-controllable, however they are expensive and tacky. In heavy usage, the reliability of the controller matters, switch owns at that challange. Also suppose these controllers are at the cylindirical handle and they are orthogonal to the cylinders revolution axis. We appreciate any help, thank you. I think it depends on the needs of the user and the technological possibilities. If the user needs to be sure that the air has a specific temperature, it would be great if that could actually be shown on the controls. However, I highly doubt that this is the case. Also, I assume that you cannot guarantee those exact temperatures. In regards to the faders vs switches, I think this depends again on the context. Switches are superior in reliability, so if there is no need for fine grained selection, I'd go with switches. Also, switches are easier to operate by touch only because you can feel the current position. This might be useful as well. Based on these assumptions, I think a relative scale like I, II, III using switches is the best fit. You are correct that a user trying to dry their hair doesn't really care if the temperature is 80C or 105C but they do care if it is HOT or COLD. The heat resistance could be handled by some other interaction independent of the fan speed. The labels don't need specific degrees and only need to indicate if the user should expect the air to be hot or not. This dual switch pattern is hard to improve upon without removing some options. It should be intuitive to most users and allow them a number of combinations for air output. If only a single fan speed is required and only a single temperature is required then the switch could be condensed to a simple ON / OFF. This completely removes the users ability to change either of the variables you listed (speed of the fan, power of the heating resistance) but it is really hard to misunderstand as well. As mentioned already, the user is unlikely to care about exact temperatures, so there's no need to specify these. If users do care, they likely need a very specific temperature, and you'll need to offer them a machine that can set it with precision (which you're not building). Users don't really care about heat or fan speed so much as the consequences for them. A higher heat will dry your hair quicker, but is more likely to damage it. A higher fan speed will dry your hair quicker, but make more noise. So the main consideration is how patient the user is. Are they willing to wait a while to take care of their hair, or are they late for work and do they need their hair dry immediately. The noise level correlates to this. If you're going to take your time, you'd like a lower noise level so you don't get a headache. This may differ per user paer day. They may take their time on the weekend, and hurry on weekdays. 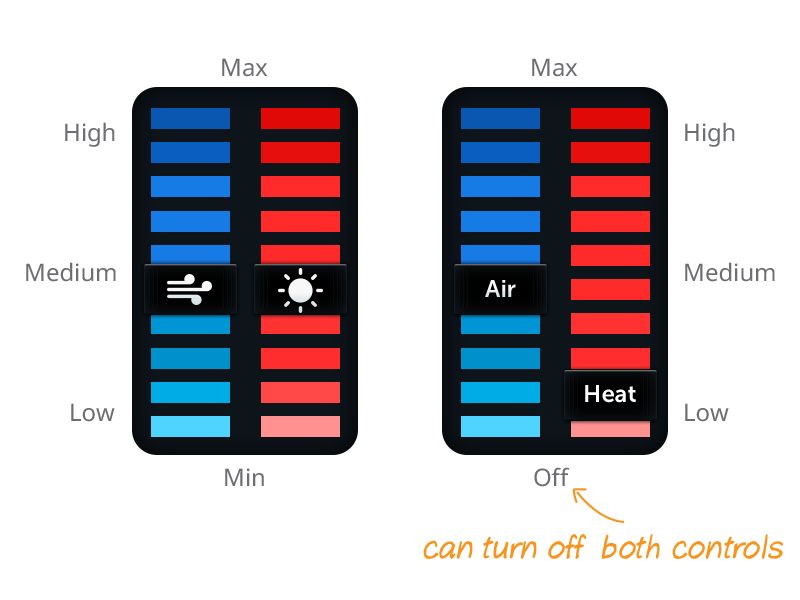 Advanced users might even like to make the choice independently: increasing the fan speed to speed things up, but not the heat. Only an increase in heat without the increase in fan speed seems like an unusual option. Based on this logic, I'd go for a single switch with three levels: low heat, low speed, low heat high speed, high heat, high speed. This simplifies things for the user. I don't think icons or labels are essential: a little experimentation will reveal what the settings do, and you can explain it in the manual if first-time users are confused. 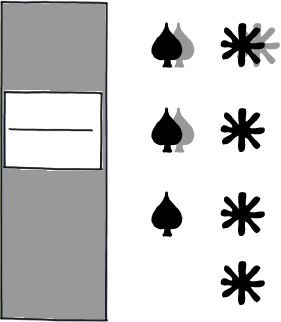 It's difficult to draw in the SE wireframe tool, but the left icons are meant to be flames, and the right ones are fans. This is assuming, of course, that there's a dead-man switch that you have to keep pressed for the hairdryer to stay on. Not the answer you're looking for? Browse other questions tagged toggle symbols or ask your own question. What's the default rotate symbol for iOs? What's a good symbol set for buttons to expand and contract parts of a hierarchy? Best way to show collapsing menu? What is the best way in letting a user set a default to an enabled function?